Working with Katello – part 4. We’re going to install Puppet modules, we’re also going to create a custom firewall module, define some rules, configure Puppet to serve files from a custom location and declare the site manifest. What we’ve done in the previous article is we’ve created a new environment called “homelab”. What we haven’t done yet is we haven’t created a Puppet folder structure. We can now go ahead and start installing Puppet modules. Below is a list of Puppet modules that we have installed and are going to use. It may look like a long list at first, but it really isn’t. Some of the modules are installed as dependencies. We can see modules for SELinux, Linux security limits, kernel tuning (sysctl), as well as OpenLDAP and sssd, Apache, WordPress and MySQL, Corosync and NFS, Zabbix and SNMP. There is the whole Graylog stack with Java/MongoDB/Elasticsearch, also Keepalived and HAProxy. The lisenet-lisenet_firewall module is the one we’ve generated ourselves. We’ll discuss it shortly. # MY_CMD="puppet module install --environment homelab"
This isn’t a full list of modules, but rather the one required by our main manifest (see the main manifest paragraph below). We could also loop the module list if we wanted to install everything in one go. This will import the lisenet_firewall class. Strangely, I couldn’t find a Hammer command to perform the imports above, chances are I may have overlooked something. If you know how to do that with the Hammer, then let me know in the comments section. See the image below to get the idea. 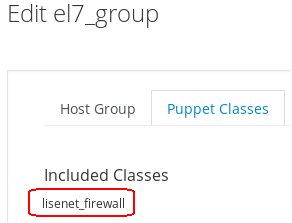 The next step is to assign the lisenet_firewall class to the host group that we’ve created previously, what in turn will apply default firewall rules defined in the manifests pre.pp and post.pp, as well as allow us to add new firewall rules directly to any host (which is a member of the group) via yaml. # hammer host sc-params --host-id "32"
Puppet automatically serves files from the files directory of every module. This does the job for the most part, however, when working in a homelab environment, we prefer to have a custom mount point where we can store all files. The file fileserver.conf configures custom static mount points for Puppet’s file server. If custom mount points are present, file resources can access them with their source attributes. As a result, files in the path directory will be served at puppet:///homelab_files/. There are a couple of files that we want to create and put in the directory straight away, as these will be used by the main manifest. We’ll strive to use encryption as much as possible, therefore we’ll need to have a TLS/SSL certificate. Let us go ahead and generate a self-signed one. We want to create a wildcard certificate so that we can use it with any homelab service, therefore when asked for a Common Name, type *.hl.local. All looks good, we can proceed forward and declare the main manifest. Edit the main manifest file /etc/puppetlabs/code/environments/homelab/manifests/site.pp and define any global overrides for the homelab environment. Note how the TLS certificate that we created previously is configured to be deployed on all servers. ## The name default (without quotes) is a special value for node names. ## node will be used. ## per host by using Katello WebUI. ## We might as well warn people from editing it. 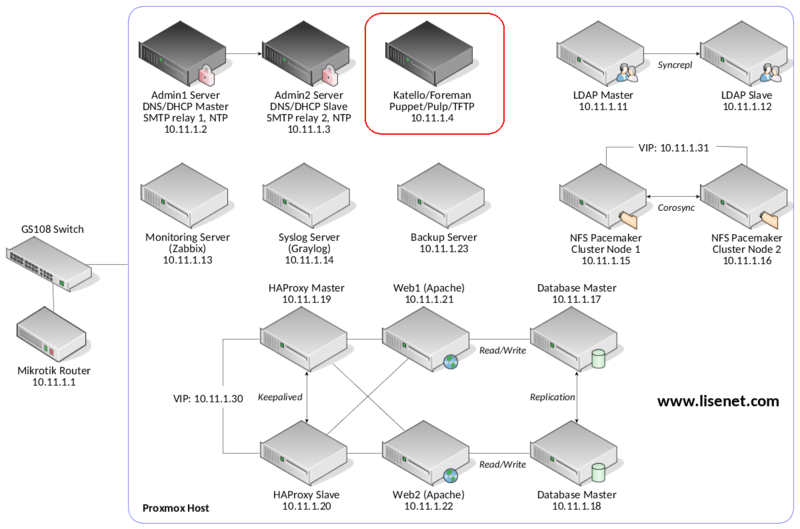 Any server that uses the Puppet homelab environment will get the configuration above applied. 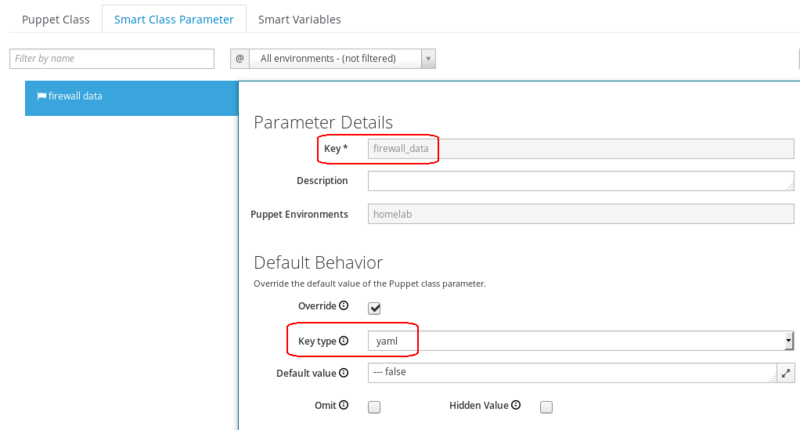 While using the Puppet homelab environment gives us flexibility to develop and test Puppet modules without having to publish them (Katello content views are published in order to lock their contents in place), once we hit production, we will need to be able to define a stable state of the modules so that anything that hasn’t been tested yet doesn’t get rolled into the environment. Katello allows us to use a separate lifecycle for Puppet modules, we’ll discuss this in the next article. Thanks very much. I’ll admit that I was not aware of this method!